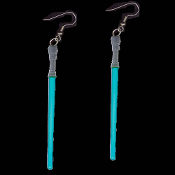 BLUE Funky Mini 3-d Star Wars Jedi Sith LIGHTSABER EARRINGS - Classic Trilogy Sci-Fi Punk Miniature Weapon Jewelry - MAY THE FORCE BE WITH YOU! Gray handle, translucent color fake beam dimensional light saber plastic charm, approx. 3-inch (7.5cm) long. Great for Yoda and Obi-Wan fans, SyFy, Halloween party or cosplay costume!